Decades of experience working with top wedding venues and luxury events spaces have helped us to establish strong relationships with many exclusive locations. This means we will be able to install even the most intricate floral art in your dream venue. With world-renowned venues like the Natural History Museum, the Royal Academy of Arts and the British Museum on our client list, we are practiced in the art of decorating grand event spaces. No matter the size or style of your chosen venue, we will make it distinctively yours for your celebration. The British Museum was founded in 1753, the first national public museum in the world. The origins of the British Museum lie in the will of the physician, naturalist and collector, Sir Hans Sloane. Over his lifetime, Sloane collected more than 71,000 objects which he wanted to be preserved intact after his death. So he bequeathed the whole collection to King George II for the nation in return for a payment of £20,000 to his heirs. The British Museum's unique grade-one listed public galleries are complemented with a suite of contemporary conference facilities such as the BP Lecture Theatre and The Raymond and Beverly Sackler Rooms. Designed by Lord Foster the spaces are available for daytime and evening events. Other gallery spaces, including the Great Court and Egyptian Sculpture and Enlightenment Galleries, are only available to hire on becoming a Sponsor or Corporate Member of the British Museum. Kew offers a number of stunning venues for a wide range of private and corporate events. Whether you are organising a wedding ceremony, reception, dinner, conference or meeting, their world-renowned gardens and iconic buildings - Cambridge Cottage, Orangery, Nash Conservatory, Princess of Wales Conservatory, The Temperate House and Joseph Banks Building - provide the most unique and unforgettable setting for your event. As accredited suppliers at this venue we can work with you to create an event that is uniquely yours. Food, Art and Design unite in the Serpentine Sackler Gallery's iconic restaurant. A light and transparent extension complements the original building's neo-classical architecture and offers beautiful views of London's Hyde Park. Perfect for exclusive corporate or private events, with dinners for up to 140 guests and receptions for up to 300 guests, or 450 guests with the adjoining Serpentine Sackler Gallery. 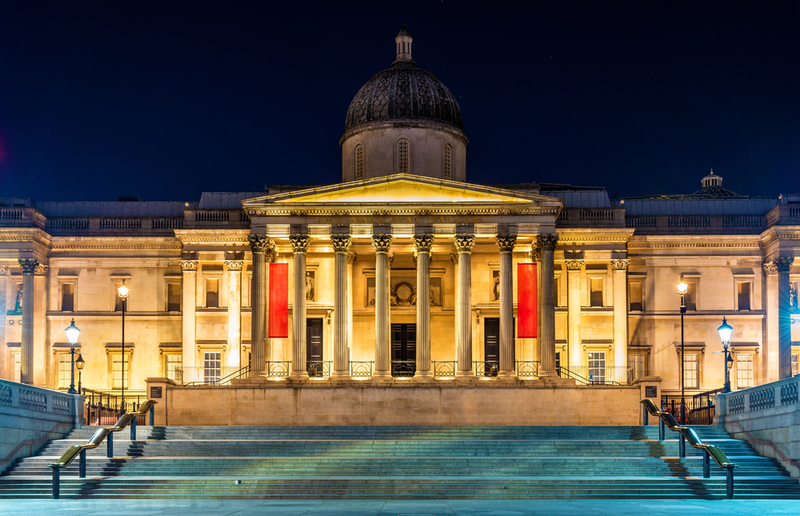 The National Gallery houses one of the greatest collections of Western European paintings in the world. Events are held the in spectacular, versatile rooms surrounded by these great masterpieces. The Gallery can be transformed to accommodate a range of events from a grand dinner to an intimate supper party, a stylish canapé reception, to a key annual conference. From the truly jaw-dropping scale of the architecturally stunning Central Hintze Hall, the out-of-this-world astronomical Earth Galleries, and the contemporary, light-filled spaces of the new Darwin Centre, the Natural History Museum is one of the largest and most versatile venues in London, in which to create a unique experience for your guests. Home to contemporary art, ancient sculptures and Old Masters, the Royal Academy is at the heart of London’s art world and its spaces can be transformed with striking effect. From the stunning John Madejski Fine Rooms - hung with works from artists such as Joshua Reynolds and David Hockney - to the main galleries, the Royal Academy of Arts is the perfect venue for entertaining. Spanning three floors and offering 360 degree panoramic views of London, Sky Garden at 20 Fenchurch Street is a truly unique venue and promises to be the most unforgettable setting for your event. 150 metres above London, the space spans three storeys boasting London’s highest landscaped public gardens. There are a range of spaces available to hire, making this is a perfect setting for intimate events of 75 through to glamorous gatherings of 600. As accredited suppliers at this venue we can work with you to create an event that is uniquely yours. Tate Britain opened on 21 July 1897 as the National Gallery of British Art. However, from the start it was commonly known as the Tate Gallery, after its founder Sir Henry Tate, and in 1932 it officially adopted that name. Before 2000, the gallery housed and displayed both British and modern collections, but the launch of Tate Modern saw Tate's modern collections move there, while the old Millbank gallery became dedicated to the display of historical and contemporary British art. Tate Britain is a magnificent, iconic building which offers versatile gallery and architectural spaces to entertain alongside iconic art. Located on the River Thames, Tate Modern is a magnificent, iconic building which offers versatile gallery and architectural spaces to entertain alongside the some of the most prestigious international modern and contemporary collections. One of the largest museums of modern and contemporary art in the world, the Tate Modern has been open since the year 2000. From the cavernous Turbine Hall to the intimate enclaves of the Blavatnik Building, there is a wide range of spaces available for any event or occasion. The Victoria and Albert Museum is the world's largest museum of decorative arts and design, housing a permanent collection of over 4.5 million objects. Founded in 1852, and named after Queen Victoria and Prince Albert, its collection spans 5,000 years of art, from ancient times to the present day, from the cultures of Europe, North America, Asia and North Africa. From wedding ceremonies and private views to fundraising dinners and awards ceremonies the museum offers endless possibilities for entertaining in a prestigious central London location. The Wallace Collection is a family collection in origin. Its works of art were collected between about 1760 and 1880 by the first four Marquesses of Hertford and Sir Richard Wallace, the son of the 4th Marquess. The collection is displayed in a domestic setting within the main London townhouse of its former owners, Sir Richard and Lady Wallace. Events can be held either in the historic surrounds of the galleries or in the contemporary glazed Courtyard, making the Wallace Collection a stunning venue for evening events, whether it be corporate entertaining, exclusive private parties and unique wedding receptions.